PRESSURE SNUBBER - for dampening and filtering. 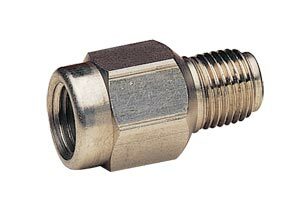 The snubber has a porous metal disc available in three standard grades of porosity. Due to the large filter surface, the snubber has less tendency to clog than orifice type devices. The housing is 303SS and the filter disc is 316SS with a maximum pressure rating of 690 bar at 25°C (PS-8 series 345 bar). Nota: 225 to 500 SSU is 10 to 50 SAE motor oil at room temperature.